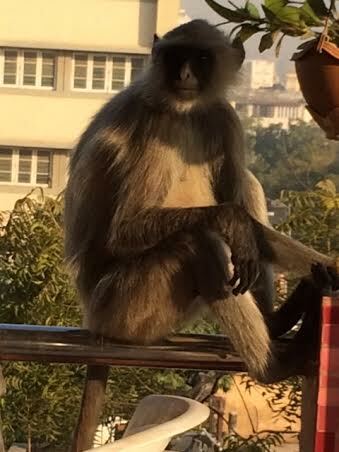 Last evening, Mukhes, the cook, knocked on our door and said one word. . . . “Monkeys!” I ran to the roof terrace which is not as elegant as it sounds and there was this very large visitor. Mukhes was feeding it pieces of potato from his hand. One of the girls ran to get a banana. The monkey peeled it, then ate it, next he ate the peel as well! I guess he wanted to savor every bite of the sweet treat, The pictures I took were too dark and blurry as I as so excited . This morning the monkey family was back, male, 2 females, and 2 babies. Muches said that since we gave them a banana they will keep coming so stay tuned for more monkey images! Mukhus is a great name for a cook, don’t you think? Off to the flower and landscape festival on the banks of the river, today. One of the students at Cept, who came to Troy, invited us to see her work. She is working on a master’s degree in landscaping. This Is Incredible India ! T I I I ! David detests monkeys but I think they are adorable! What do you think? 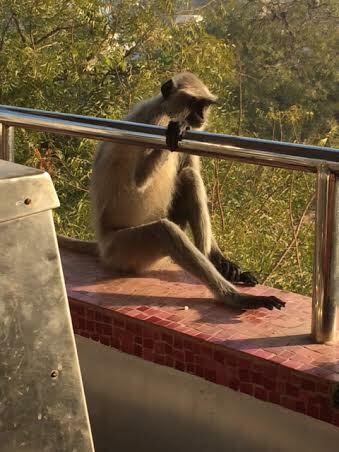 This entry was posted in Animals, India, Travel, Uncategorized and tagged Amdavad, bananas, hostel, India, monkey, Presidency Enclave, roof terrace. Bookmark the permalink. 22 Responses to Visitor on the Roof! It’s always to good to find non Indians talk and write about our incredible India. Lovely images. I can’t tell you how thrilled we are to be back in incredible India for four months. When we arrived, it was as if we were home on a different continent with different students. It is ever so fun to see them be put on the magical spell of India in just a week! Off to Rajasthan week after next. This coming week, we are attending 3 of the 4 days of a lovely wedding, + Amdavad’s amazing Kite Festival and the kids are supposed to be doing some work. . . in between all the fun ! Oh dear, I am not a very good photographer,but some of the students are. I will do my best not to disappoint you. Will do my best not to disappoint you ! Happy Sunday ! You are incredibly incredible in India. Well done. Great writings. Ah, thanks so much. I am loving every single minute of my time here! Smiles. . .. I adore India! Big smiles. . . .
seems like a GREAT place – (thanks for the smiles) and I could Indian food every day and never tire of it! Wow, that is amazing. I love monkeys, they are so cheeky and clever. Looking forward to seeing more happy pics. You know what I think 😉 Don’t get bitten or scratched because monkeys can carry rabies. I’m the party pooper. No, it is good advice as usual. Wanted you to know everyone is being careful , and so far all 12 of us are well! Thank God! Thanks… sounds good but then all your ideas sound good!!!! Thank you for the lovely comment! Smiles. . . . . Indeed, every minute of my time in India was quite an experience! I loved the animals! Thank you .